This version is for existing users of Wirecast Pro for Mac and enables you to go from version 4-7 up to the current version. 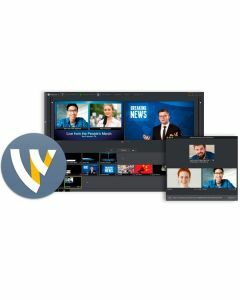 Telestream Wirecast Pro software lets you tell your story live with your Mac computer. This version of Wirecast Pro lets you upgrade your Wirecast Pro 4/5/6/7 software to the current version of Wirecast Pro. Take in an unlimited number of video sources, switch between them, and stream live to your favorite CDN, be it YouTube, Facebook, Twitter, or a dedicated streaming server. You can even stream to multiple destinations simultaneously while recording individual video feeds for post production editing. Whether you're producing sports, educational, musical, or any other live content, Wirecast Pro has what you need for productions of any size. Stream to Facebook Live, Twitter, YouTube, Vimeo Live, or any RTMP destination. Stream to more than one destination at a time to get your content out. Stream and record at the same time. Great for archiving or off-line editing. Record MP4 or MOV files to any drive on your system. Rendezvous peer-to-peer conferencing comes built-in to Wirecast. Send guests a link to join your live broadcast. Up to seven guests can be featured simultaneously for panels and group discussions guests can be featured simultaneously. Over 100 built-in graphics and titles. NewBlue Titler Live Present, free with Wirecast, is a great way to display animated graphics and titles to your audience without having to purchase additional plugins. Wirecast has built-in professional features that let your live viewers follow the action in the moment, analyze plays, and see updated scores. Use readily available generic MIDI controllers, or the custom-designed X-keys control surface for faster and more tactile operation of Wirecast.